Located in the mid-southwestern region of Morocco is the hub of cultures and religions, Marrakech. This millennium old city has grown rapidly across the years and is one of the largest in the country and is also a popular tourist destination. This is the very city whose name is the root to the name of the country; that surely says a lot about what you can expect on your trip here. This is a shoppers’ paradise and is the hub for bargaining; it also serves as a gateway to the Atlas Mountains. One of the most popular places among tourists are the Medina Souks and their labyrinthine mazes which are filled with shops and the experience is fueled with a variety of colors, scents and sounds. Find some amazing perfumes at El-Attarine Souk and authentic Moroccan leather at Cherratine Souk. 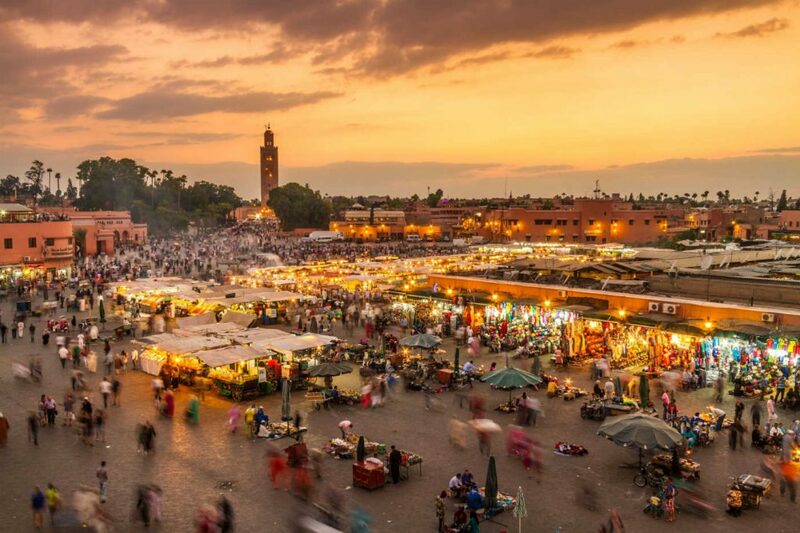 The entrance to the Medina is an enormous square, Djemaa El Fna, which is the hub of Marrakech life and boasts of the entire spectrum of Moroccan life, and dining in the rooftop cafes or restaurants while observing the market life go by is an experience in itself. The Majorelle and Manara Gardens are the best places to get out of the hustle-bustle of the city and relax, and the former is the complete work of a painter, Jacques Majorelle. The towering Koutoubia Mosque with its 70 meter tall minaret is striking from the first sight. Built in 1162, this mosque shows off some amazing Almohad architecture. Tourists can get a peek into schools of the past by visiting Medersa Ben Youssef, which is the largest theological college in Morocco and is nearly 500 years old. Fine architecture with stalactite ceilings and zellige tiling are sure to leave you awestruck and this is probably the reason why it’s a popular tourist site. The Saadian Tombs are burial grounds for members of Saadian dynasty and have some ancient architecture. The magnificence of the grand Bahia Palace is unparalleled and the interior decoration with the dazzling tiles and painted ceilings goes perfectly well with the flower and tree-filled gardens surrounding the palace. An old palace turned into a museum, Dar Si Said Museum of Moroccan Arts and Crafts is as attractive a place to visit for its own architecture as much as it is for the splendid collection of traditional Moroccan items like door and window frames and Berber jewelry. The oldest monument in the city called Almoravid Koubba was built in the 12th century and has an enormous ceiling topped with a dome. It is one of the very few buildings here that have survived the test of time and this is reason enough to visit it. Tizi-n’Test Pass is the place to head to for some driving fun with its dizzy zig-zag roads skirting through mountains and giving some splendid scenery on the way. This city may have grown into a metropolis in the recent years but it remains true to its soul and still encompasses the rich heritage of the country and is a window into the past of Morocco.